The other day we gave this one a try, but played with a couple of important errors (the rules didn't specify the value of the pawns and crowns, so we assumed 10 and 11. Turns out they should be valued as 1. This error caused branches to be very short. We'll try to play it again with the correct rules, but it seems interesting. When you say the value "should be…1", do you mean for the purpose of finishing a branch or for the purpose of endgame scoring? I haven't had a chance to try this one yet, but I am puzzled by how much Crowns and Pawns add to a branch. 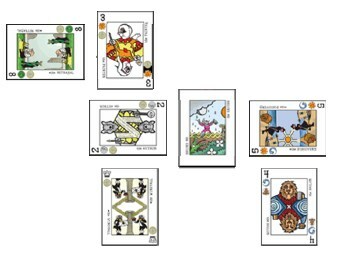 I meant for the purpose of adding the values of the cards on the branches. When scoring you actually add up the number of suit symbols on all the cards except for suits where you got an Ace. Then, add 1 point each Crown and 2 points for each Pawn. Oops. I see now where it says that in the rules! 1. If I understand correct, there can be at most four branches of the tree: two major branches from the Excuse, each splitting into two minor branches. Have I got that right? 2. 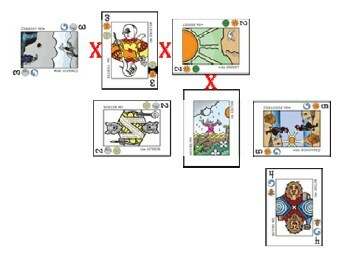 If I understand correctly, the Excuse (being up or down) only changes the distribution of cards that were put there on a previous turn when someone could not otherwise make a play. There might be no cards there at all. 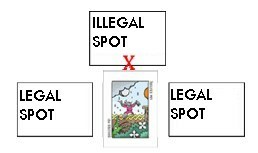 Or does the Excuse (being up or down) affect how all cards are distributed, including ones from the branches of the tree? In case of a tie, nobody gets the Ace, right? Right. It's needed majority. If anyone has more points, no one gets the Ace. But if someone has the Ace of previous hands and ties with others in the last hand, he maintains the Ace.